What could be better? 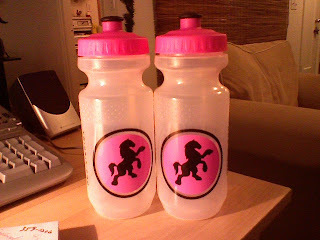 Pink bottles to match my pink tires! I'm so excited. I just got these from Fat Cyclist. I'll be able to match Danielb and his Fat Cyclist jersey. twinsix.com if you're interested. I can't wait to use these. Of course. When you're in pink, they're yours. Do you actually still ride?